Der Mangel an Früchten und Gemüse sowie der übermäßige Verzehr von Fleisch und Salz sollen für mehr als neun Prozent aller Krebsfälle verantwortlich sein. I knew that meat consumption is said to contribute to some health conditions, but I haven't heard about the association with cancer yet. Is there solid scientific evidence to link the consumption of meat with a higher risk for developing cancer? According to the study eating meat is a risk factor, although other factors (e.g. smoking) are more significant. 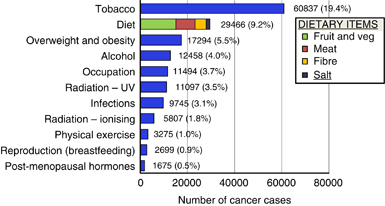 To briefly answer your question: meat consumption is correlated with some cancers. Medical studies involving statistics look at correlation, not causation. In the answer to the question Is a vegetarian (vegan) diet more healthy?, I cited an epidemiological study that may be found in Am J Clin Nutr September 1988 vol. 48 no. 3 739-748 (which you may read in full. It compares a large number (n=27,529) of Seventh-Day Adventists. Please look at my answer at https://skeptics.stackexchange.com/a/2058/1403, where I deal with the math (a little) and describe the differences between correlation and causation. The available epidemiologic data are not sufficient to support an independent and unequivocal positive association between red meat intake and CRC. This conclusion is based on summary associations that are weak in magnitude, heterogeneity across studies, inconsistent patterns of associations across the subgroup analyses, and the likely influence of confounding by other dietary and lifestyle factors. Overall, summary associations were weak in magnitude (i.e. most less than 1.20), processed meat definitions and analytical comparisons were highly variable across studies, and isolating the independent effects of processed meat intake is difficult, given the likely influence of confounding by other dietary and lifestyle factors. Therefore, the currently available epidemiologic evidence is not sufficient to support a clear and unequivocal independent positive association between processed meat consumption and CRC. Overall, weak positive summary associations were observed across all meta-analysis models, with the majority being non-statistically significant. Heterogeneity was evident in most analyses, summary associations were sensitive to the choice of analytical model (fixed v. random effects), and publication bias appeared to have produced slightly elevated summary associations. On the basis of this quantitative assessment, red meat and processed meat intake does not appear to be independently associated with increasing the risk of breast cancer, although further investigations of potential effect modifiers, such as analyses by hormone receptor status, may provide valuable insight to potential patterns of associations. Similarly, no association with red meat was observed for advanced prostate cancer (SRRE = 1.01, 95% CI: 0.94-1.09). A weakly elevated summary association between processed meat and total prostate cancer was found (SRRE = 1.05, 95% CI: 0.99-1.12), although heterogeneity was present, the association was attenuated in a sub-group analysis of studies that adjusted for multiple potential confounding factors, and publication bias likely affected the summary effect. In conclusion, the results of this meta-analysis are not supportive of an independent positive association between red or processed meat intake and prostate cancer. To reiterate all these papers have at least one researcher in common, so there is possible bias. Also I currently don't have access to full texts so I do not know the funding of these studies and I do not have the expertise to analyze the statistical side much. Consumption of red meat and processed meat was positively associated with risk of both colon and rectal cancer, although the association with red meat appeared to be stronger for rectal cancer. In 3 studies that reported results for subsites in the colon, high consumption of processed meat was associated with an increased risk of distal colon cancer but not of proximal colon cancer. The results of this meta-analysis of prospective studies support the hypothesis that high consumption of red meat and of processed meat is associated with an increased risk of colorectal cancer. The possible cancer effects seem fairly small considering that the evidence is epidemiologic. The last paper I mentioned offers risk ratio of 1.28, so somewhat small increase. To put this into perspective CDC claims that smokers are 15-30 times more likely to get lung cancer compared to non-smokers. Not the answer you're looking for? Browse other questions tagged medical-science nutrition cancer epidemiology meat .